More than 4.4 million people are on the legal immigrant visa waiting list according to the State Department's annual tally. That is 100,085 more people waiting for legal immigrant visas than at the same time last year. Ninety-eight percent of those waiting have been sponsored by a family member in the United States. The people on this waiting list have shown that they have a qualifying family relationship or that they have been sponsored by a qualifying employer. The list does not include those who are already in the United States waiting to adjust from a legal temporary status to a green card. The waiting lists are needed because of annual limits on the number of immigrants that can be admitted in certain family and employment categories, and because of caps on the number who can come from each country. Table 1 shows the number of applicants waiting by country, as of November 2014. The waiting list should not be confused with the processing backlogs, which represent the length of time it takes for USCIS to adjudicate each application or petition. The waiting lists occur because the demand for green cards exceeds the limits enacted by Congress to regulate the level of immigration; the processing backlogs occur because USCIS has not effectively managed the huge volume of applications from people seeking immigration benefits. For example, it has taken more than 16 months to process the application for the wife and children of U.S. citizen Jimmy Gugliotta (there are no numerical limits for spouses and minor children of citizens), largely because USCIS has diverted staff to processing deferred action and work permits for illegal aliens covered in the president's controversial executive actions. The waiting times in the family categories range from 19 months to 33 years. The waits in the employment categories range from none to just over 11 years. The law allows for an unlimited number of immigrants who are the spouse, child, or parent of an adult U.S. citizen, so there is no waiting list in that category (although there is a processing time of five months for the initial petition plus additional months for the application itself to be reviewed). 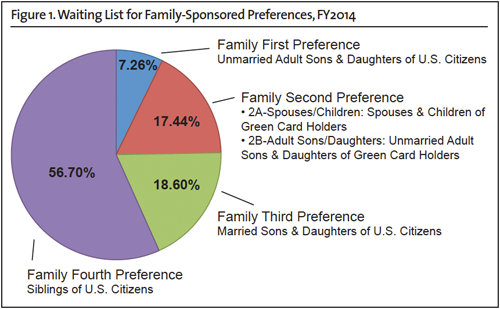 More than half of the waiting list is comprised of about 2.5 million people who have been sponsored by a sibling who is a U.S. citizen (see Figure 1). These applicants must wait at least 13 years for their application to be adjudicated. The largest number (30 percent) are citizens of Mexico, and the wait for them is just over 18 years. Another 806,000 applicants are adult married sons and daughters of U.S. citizens. The wait for most applicants in this category is just over 11 years. However, about 40 percent of those waiting in this category are from Mexico and the Philippines, and their wait is more than 20 years. The employment visa waiting list is relatively tiny, with about 91,000 applicants, representing about 2 percent of the total waiting list (again, it does not include those already living in the United States with some other, temporary legal status). 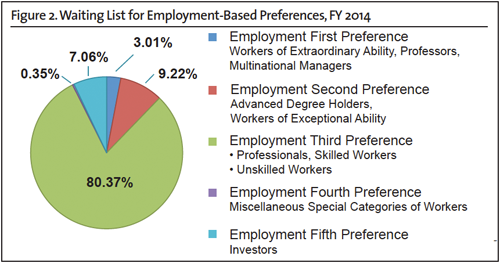 More than two-thirds of these applicants are in the category for skilled workers. About 44 percent of those waiting are from the Philippines and another 33 percent are from India. Applicants from the Philippines face a wait of just over six months, while the wait for applicants from India is just over 11 years. The size of the waiting list grew in every family category over the last year, with the list growing most in the category for unmarried adult sons and daughters of U.S. citizens. In contrast, the employment category waiting lists shrank considerably in the last year, with the exception of the controversial EB-5 category, which grew by 35 percent, from 4,748 to 6,418. The existence of this massive waiting list of eligible applicants for family immigrant visas and green cards raises important questions for policymakers. First, there is clearly no shortage of eligible immigrants being sponsored by family members and employers who are waiting many years for their opportunity to be admitted legally. Any move by the president to relax eligibility standards or grant benefits such as work permits, deferred action, or parole to illegal aliens is profoundly unfair and destructive to the integrity of the legal system because it gives illegal aliens preferential treatment over those applying through the legal process established by Congress. For example, the implementation of the controversial new Central American Minors program allows illegal aliens from El Salvador and two other countries to bring in family members without fees and regardless of prior deportations or felony convictions. Meanwhile, 77,000 legal applicants from El Salvador have to pay the regular application fees, meet higher eligibility standards, and keep waiting for their turn. Secondly, the composition of the waiting list, with three-fourths of the people waiting in the two lowest priority categories for family-based green cards and waiting times that are measured in decades, suggests that it is past time for Congress to examine whether it still makes any sense to have some of these categories at all. Our legal immigration system is promising the opportunity of a green card to millions more people than realistically can be admitted in a reasonable time frame. This seems more like a cruel joke than a responsible immigration policy. Along with the visa lottery, the two lowest-priority family categories should be jettisoned, and at least a portion of the fees should be refunded (from the agency's huge reserve fund).